Triple doubles - Vermont Symphony Orchestra Courtesy of Bridge Records, inc. When the Vermont Symphony Orchestra was formed in 1935, it was made up of retirees and other musicians from across rural Vermont, some of whom had day jobs as doctors or postal carriers. Today, it's a fully professional orchestra led by music director Jaime Laredo, who's also a recitalist, violin soloist and a member of the renowned Kalichstein-Laredo-Robinson Trio. For their first-ever commercial recording, the Vermont Symphony Orchestra wanted to recognize the musical impact that Jaime Laredo and (his wife, cellist) Sharon Robinson have had in their adopted state of Vermont. So they released recording called Triple Doubles, which features three double concertos written specifically for this husband-wife duo. Sarah Hicks conducts two of the three concertos on this disc. Hicks serves as the principle conductor of Pops and Presentations for the Minnesota Orchestra, and she's also on staff at the Curtis Institute in Philadelphia. That's where she first met Laredo and Robinson when she was a student in the late 1990's, a meeting that turned into a full-fledged friendship. "It's the connection between me and them and Curtis and also David Ludwig, one of the composers on this disc. He was a student with me at Curtis and he and I also taught there," she explains. "He still teaches there and he became the resident composer for the Vermont Symphony, so it was sort of this big symbiotic thing. It was just a big thrill to be a part of this project." The recording opens with a powerful three-movement work by Richard Danielpour, a composer Sarah Hicks knows well. "It's a resetting of a trio, actually, called 'A Child's Reliquary,'" she explains. "And it was in reaction to the death of a child of a very dear friend, reset for orchestra for this project. So it's very much a conversation between the two instruments [violin and cello] and the orchestra." You can hear the sense of loss in "A Child's Reliquary" but there are also moments of joy and reflection, as if you're opening a photo album and remembering the life of a child. "Exactly," Hicks agrees. "There's a sense of celebration as well and there's also the returning motive of the Brahms lullaby that comes in several guises, that comes in several different harmonies, which is motific throughout the piece. Sometimes it's beautiful and ethereal as if in a wonderful memory of this child, and sometimes it's just absolutely heartbreaking. It's sort of a stifled cry. So it's a really powerful piece." Sarah Hicks recalls her first encounter with this piece. It was several years ago when she first performed it with the Vermont Symphony Orchestra at a festival in Maine, an experience Hicks will never forget. "It had such an impact on the audience and on me as well. You rarely get that emotional when you're conducting a piece but for me this was something that really sort of struck me to the core. And I'm really glad we got it down on disc." Hicks also leads the Vermont Symphony Orchestra in the Concerto for Violin, Cello and Orchestra by David Ludwig. This piece is a reflection of all different kinds of love. You can hear one of the most intriguing elements of this work in the gorgeous central adagio. "What I found most interesting," Hicks explains, "is that he put these two interludes between the major movements. And so the first interlude called 'Calypso's Dance,' is for violin and percussion and it's just a really interesting setting to use those instruments. And it was really challenging to record it because that's not a usual combination of instruments. But I like how David interspersed these interludes between these major movements so that each instrument had their particular voice." According to Sarah Hicks, one of the great advantages of being a musician is that you're able to work with friends, which is what made this recording project so much fun. It was also quite special to see Jaime Laredo and Sharon Robinson interact with one another as longtime musicians, and life partners. "They know each other's strengths and weaknesses and when they'd play together, they would sort of bicker sometimes," Hicks observed. "Oh Honey, that's not in tune, that third needs to be lower. And you know, they're very direct with each other and then they would lay into their instruments and these incredible sounds would come forth." 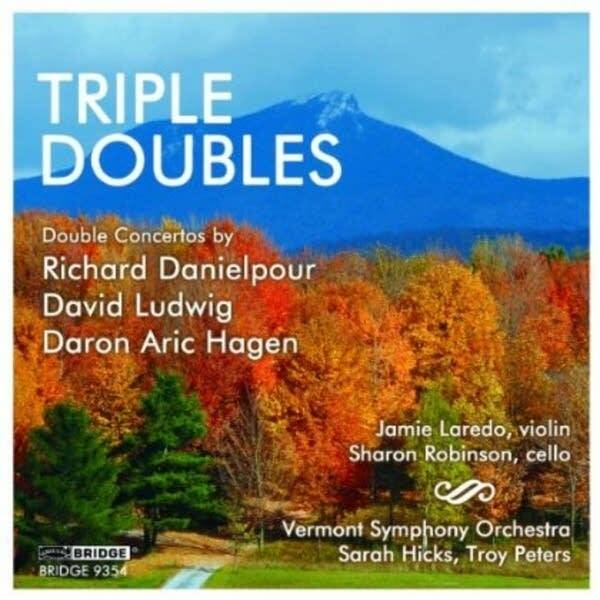 Those incredible sounds resonant in each of the three concertos featured on, Triple Doubles, the first commercial recording by the Vermont Symphony Orchestra, which pays tribute to the husband-wife duo Jaime Laredo and Sharon Robinson.